Who do you work for today? While preparing for this article I was searching for a good opening quote. While there are many known quotes from business people about the role of the customer and shift of power from the company to a customer1 I finally decided to use a story mentioned in a radio, which stresses the importance of not losing your North Star. It goes like this: Some time ago a Hasidic Rabbi asked a janitor if he could do something for him. At first, a janitor was hesitant as he had other things to do, but Rebbe asked him for only one thing: Every time you see me, come to me, look me in the eyes and ask me: Who do you work for today? This story underscores a common problem many organizations face. While on the surface we all know that we serve our customers, very often our processes are organized in such a way to make work more convenient for us (inside-out view) and the notion of the customer is often alien to many employees. That’s why increased visibility of the Customer Experience is a very good sign as it forces organizations to take the outside-in view into account. One map to rule them all? However, does it mean we should stop modeling processes as it is done today and focus only on Customer Journeys instead? Many notations popular today for modeling processes do not pay much attention to the customer. For example, BPMN suggests modeling Business Process Diagrams with many pools representing process participants. One of the pools very often represents the customer; however, generally it is modeled as a black-box pool (i.e. the content of the pool is not modeled in detail) with message flows showing communication between the customer and organization. This is a good first step, but doesn’t give us better insight into the customer’s feelings and motivations. Quite paradoxically – the modeling notation from the mid-90’s offered better support for the Customer Experience. One of the first BPM projects I participated in used a notation called LOVEM (“Line of Visibility Enterprise Modeling”) devised by IBM. You can read more about LOVEM in Advisor from 2007. An interesting feature of the LOVEM diagrams was the fact that they always started with a customer (it was a top lane), and it was possible to show the touchpoints and moments of truth. 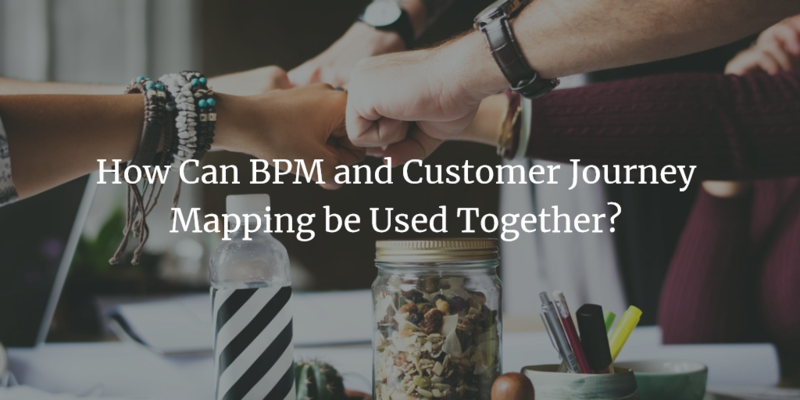 There is no obvious choice for modeling customer journeys using established BPM or EAM notations, so no wonder there are dozens of various approaches for CJM with no common standard2. They range from infographic-like pictures to models using some common shapes, but commonly give readers better insights into the interactions between a customer and a company in a way that shows the flow from the customer perspective. A Customer Journey Map usually shows one persona (or customer avatar) representing some segment of customers and steps which she follows to reach her goal. What is different from a standard business process is the fact that CJMs show not only tacit elements like the actions performed by a customer, channels used and touchpoints with a company, but also elements such as customer hopes, fears, and aspirations driving their behaviors. Additionally, for the steps where the customer interacts with employees (or more and more commonly with IT systems) of the company, it is possible to show whether those interactions increase the satisfaction, or detract from it. The benefit is obvious – especially for companies that had not yet created a real business process architecture. By creating customer journeys, they can finally create a common view of how they interact with a customer rather than seeing only the department or system particular views. insights into the customer’s real motivations have a positive impact on product creation and marketing. For a long time, we approached our customers like Henry Ford (“Any customer can have a car painted any color that he wants so long as it is black.”), treating them all the same and focusing on the functional aspects of our products and services. Now with savvier and more empowered customers competing only on the basis of price or product features is not enough. Customers want experiences, and it is not possible to build those experiences without understanding what drives them. However, while customer journey maps are very valuable, we should not treat them as the sole source of truth. Instead, they should be used as parts of a multi-dimensional view of our organization. Customer Journey Maps allow us to understand our customers better and state who we serve3. But to create a consistent customer experience we also need good business processes, integrated enterprise architecture and many other aspects our customers most likely do not think about, but that are, nonetheless, crucial for the company (for example risk and compliance). So, what we need is to a comprehensive view of the organization in the form of a repository with many inter-relations between the diagrams which can be easily analyzed and used by various roles collaborating together: BPM and CX specialists, EAM/IT and GRC experts, and many others. Only then we can really build exceptional experiences for the customers in a way which also makes sense from the internal perspective. PS. You can learn more about relations between BPM and CX in the follow-up article on BPTrends. 2MWD Advisors performed recently a survey on this topic: https://www.mwdadvisors.com/2016/04/28/customer-journey-mapping-survey/. 3By the way: it also makes a lot of sense not only to state who are our perfect customers but also who are the customers we do not target.